Hey, i love the ranking in game and i pretty much only compete with myself to hit the highest KD possible, i might not be the best but i still love to see my progress and how i can increase my kd by switching my game. Altho there is one thing i kinda do miss within the "/Rank" system. I know that other servers that looks like they use the same system has a "Session" option which shows you the KD and score from the time you have been online on the server within this "login" you are playing now. Kinda rough explanation of what im trying to get through but i hope you do understand me. Thanks for a good server! Btw, thanks to the mods on the server! Really has gotten better lately and you deserve some credit for it. Can you give me more details what information you want to see? Only kills, deaths and the KD? Maybe you can post a screenshot of such a feature. Who uses less bullets to kill another player with the rifles ( M4 AK47 Famas .... ) Should be higher in the top. 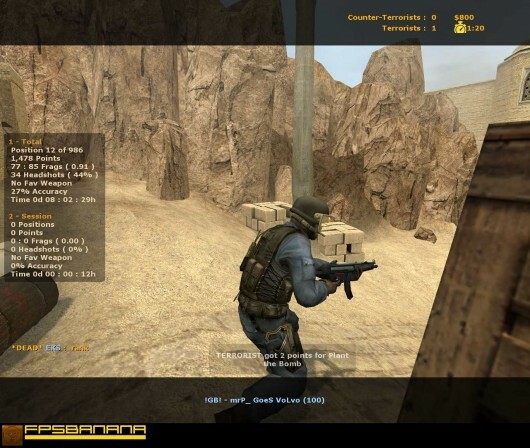 I'm not online right now on steam but i found a photo on google, now this is an old photo fom Css and i guess a completely different mod than what you use on the server. But this atleast does kinda show what i was thinking about. Might not be doable with the plugin that 4played use but i had to ask for i. If you don't trust my links simply search google for "css mod !session".